Bank of Japan Governor Haruhiko Kuroda defended his yield curve control policy on Monday, saying it had kept Japan's long-term interest rates from joining the uptrend in global yields and was helping the economy overcome stagnation. Kuroda also shrugged off criticism made by some academics that his 2 percent inflation target was too ambitious for a country long mired in deflation, arguing that the BOJ can leave itself enough policy ammunition to fend off future shocks to the economy only by accelerating price growth to its target. In a speech to the Keidanren business lobby, Kuroda offered an upbeat view on the global economy, saying it was emerging from the doldrums as factory and trade activity picked up. "The global economy seems to be finally entering a new phase, by putting the negative legacy of the global financial crisis behind it, although considerable uncertainties lie ahead," he said. The BOJ's new policy framework aimed at capping long-term interest rates will help maximize the benefits of such global tailwinds for Japan's economy, Kuroda said. "By implementing this policy framework in an appropriate manner, the BOJ can take advantage of the recovery momentum of the global economy to produce an even greater driving force for Japan's economy," he said. Kuroda's remarks underscore the growing sense of optimism BOJ policymakers share on the outlook for Japan's economy and reinforce market expectations that the bank will hold off on expanding monetary stimulus in coming months. 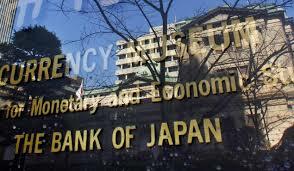 Having failed to meet its price target despite more than three years of heavy money printing, the BOJ shifted its target from the pace of money printing to interest rates in September. It now guides short-term interest rates at minus 0.1 percent and the 10-year government bond yield around zero percent. The BOJ's resolve to cap yields have been under test as Japanese long-term rates have risen in tandem with global bond yields on the perceived inflation-stoking policies of incoming U.S. President Donald Trump. That in turn has led to some market expectations the BOJ may raise its yield target as early as next year. But any such step is likely to face resistance from advocates of aggressive easing in the nine-member board. The BOJ maintains loose guidance that it will continue buying government bonds so that the balance of its holdings increases at an annual pace of 80 trillion yen ($682 billion), likely intended to appease board members who argued that heavy money printing helps heighten inflation expectations. At a rate review on Nov. 1, BOJ policymakers disagreed on how much emphasis the central bank should place on the size of its bond purchases under the new framework targeting interest rates, minutes of the meeting showed on Monday. One board member said the guidance on the bond buying amount could gradually be phased down "over the course of time" as the BOJ would likely achieve its yield targets with fewer purchases. That is in line with comments made publicly by Kuroda when he said the BOJ may slow its bond buying if it can meet its yield targets while buying fewer bonds. But some board members insisted the BOJ continue to offer the guidance because deleting it could send "a wrong signal to markets" by making it appear as if it was considering tapering its asset purchases, the minutes showed.